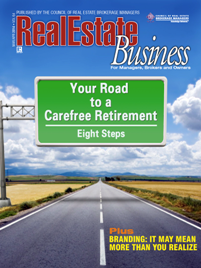 "Your Road to a Carefree Retirement: Eight Steps"
"Branding: It May Mean More Than You Realize"
Recruiting: "I'm Happy Where I Am: Six Reasons Agents Stay, and How to Move them"
Sales Strategies: "Filling the Holes in Your Leaky Bucket"
Hello I am really excited to read this magazine , Is there any problem with the click here button it is giving an error of "404 Page not found" .So I request you to check the link . Thanks, Levi. Our apologies for any confusion. It seems to be working fine at this end. This direct link may work better: http://www.crb.com/newsandevents/publications/reb/2014-03/MarchApril2014.aspx.